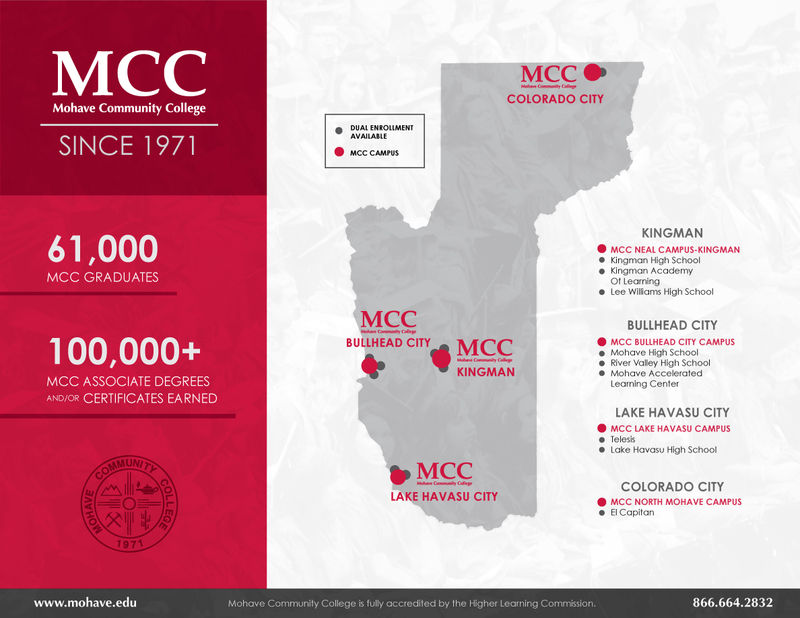 Mohave Community College brings many significant positive benefits to Mohave County, and since 1971 has helped 61,000 residents earn more than 100,000 associate degrees and/or higher education certificates. Many of those graduates are currently working in the Mohave County region, making positive contributions to our communities. As you can see in the map, MCC works closely with our local high schools, offering students the opportunity to earn college credits through the dual enrollment program. MCC graduates enter fields in which they earn between $42,640 to $65,000 thousand a year on average. Compare that to those in the Mohave County region with only a high school diploma who earn $24,500 per year on average. 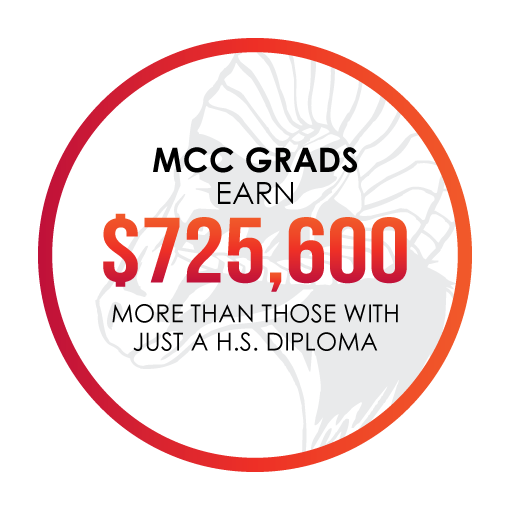 An MCC graduate has the potential to earn $725,600 more in their career than a Mohave County resident who only has a high school diploma. Students find that once they start at MCC, a bright future starts to take shape. Lake Havasu City Mayor Cal Sheehy started taking MCC classes when he was a student at Lake Havasu High School. Bullhead City Police Chief Brian Williamson used the college’s Veterans Services to help him get on the path to success. Mohave County Supervisor Jean Bishop was a single working mother when she started at MCC. The college’s flexible schedules helped her succeed. Hear them in their own words on the We Are MCC page. Former MCC students also contribute to their local community economies in many ways. On the economic end, research shows MCC alumni generated $190.9 million dollars annually in our local communities. Over the years, students have studied at MCC and entered or re-entered the workforce with newly-acquired skills. Today, thousands of these former students are employed in Mohave County. MCC students are also community leaders. Mayor Sheehy, Police Chief Williamson and County Supervisor Jean Bishop are just a few. With more than 61,000 graduates and counting, there are thousands of former and current students making a positive impact in our region, and many will be our future community leaders. 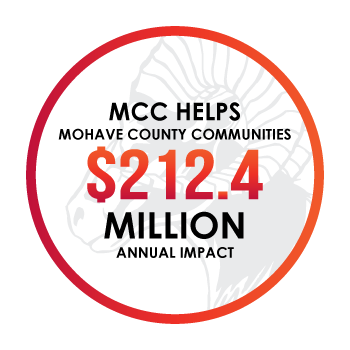 Market research shows MCC generates a positive return on investment for students and communities in Mohave County. The college adds $212.4 million to the Mohave County economy each year. For every one dollar invested in MCC, the public receives a cumulative value of $7.50 in benefits. 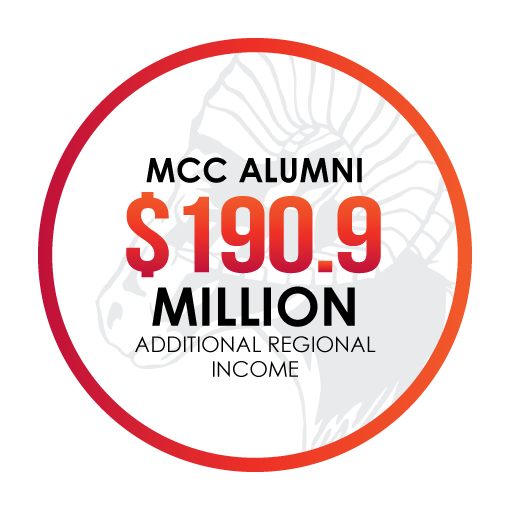 MCC alumni generate an additional $191 million in economic benefits to the region each year. 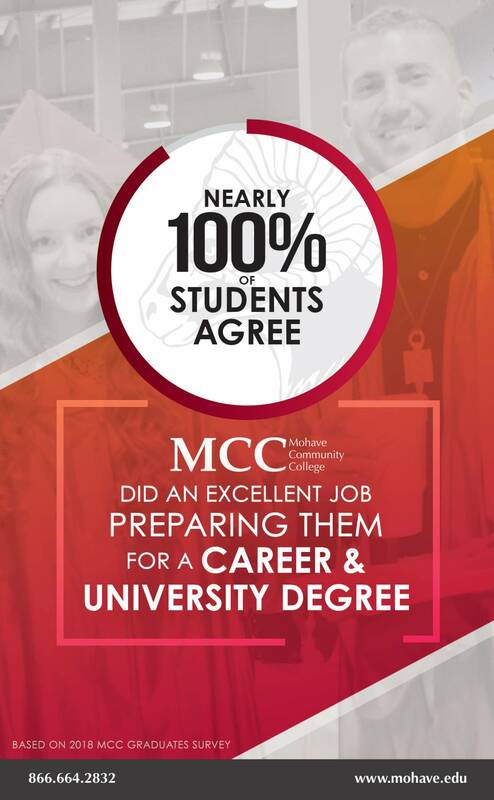 96% of MCC graduates surveyed in 2018 agree, the college did an excellent job preparing them for a career and/or pursuit of continuing their higher education at a university. Information above is based on data collected by MCC Institutional Research Division, and Economic Modeling Specialists International, a leading provider of economic impact studies and labor market data.